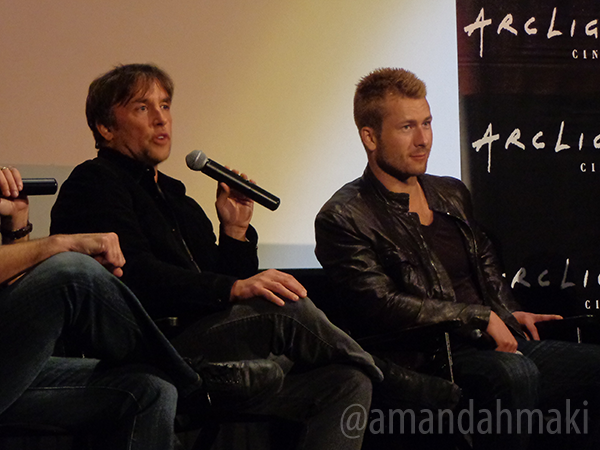 Added photos from the Q&A that took place after the screening of ‘Everybody Wants Some! !’ at the Arclight Hollywood on 03.30.16. 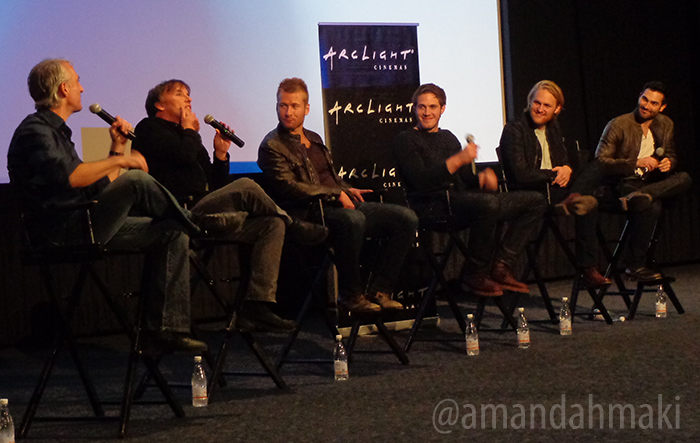 The Q&A was with Tyler, Richard Linklater, Glen Powell, Wyatt Russell & Blake Jenner. That struggle lies at the heart of the film, opening April 1 and starring an ensemble cast that includes Hoechlin, Blake Jenner (“Glee”) and Will Brittain (“Lila and Eve”) as members of a 1980 Texas college baseball team moving into their house the weekend before the school year starts. A countdown clock ticks off the seconds until that first Monday morning class, always reminding the audience that something is slipping away. It’s a familiar point for writer-director Richard Linklater. After all, chronicling a boy’s childhood from 6 to 18 (“Boyhood”), checking in on a couple’s relationship every nine years (“Before Sunrise,” “Before Sunset” and “Before Midnight”), meandering with a group of teenagers on their last day of high school (“Dazed and Confused”) … if you were going to make an argument that the filmmaker is obsessed with time, you wouldn’t find a shortage of evidence. Maintaining that focus along with Linklater’s familiar indifference toward plot (as in, there barely is one), “Everybody Wants Some” dismisses any idea of a traditional narrative with a laugh and a haze of smoke—it takes a long time to realize the major, story-propelling incident you’re waiting for isn’t coming. It’s a neat trick; simultaneously wishing that things would get started and feeling like they’re slipping away is a universally experienced state of mind, a contradiction that hit home with Hoechlin. Sports in particular present the challenge of existing in a moment—an athlete must forget the last play and focus on the current one. 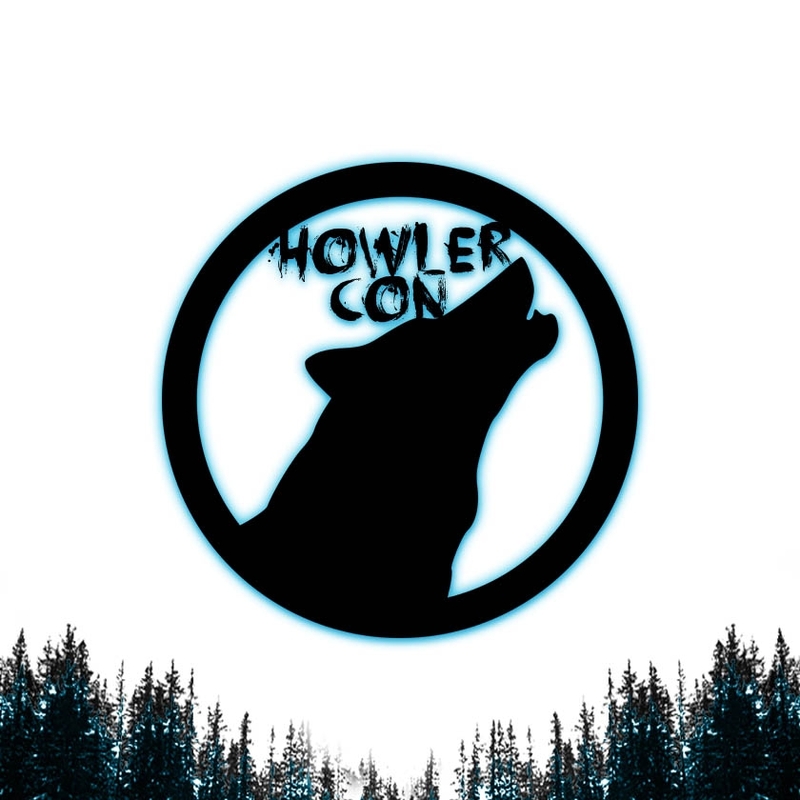 Hoechlin said Linklater expressed the belief that, “You can’t grow up until you stop playing sports,” and some members of the team are more aware of this than others. Jenner, 23, stars as Jake, a freshman pitcher eager to prove himself, and Brittain, 25, is his roommate Billy, a freshman who can always be found by following the phone cord (’80s = landlines) as he talks with his girlfriend back home. Hoechlin’s character, McReynolds, faces very different challenges—he’s the team’s veteran hitter, coming to a fork that either heads to playing pro ball or saying goodbye to baseball forever, a feeling the actor knows all too well. On campus, the guys of “Everybody Wants Some” are eager to categorize themselves as baseball players instead of just explaining themselves by their chosen major. Beyond being afraid to grow up, they’re scared of losing their identity or, as one character puts it, “never being more than some dude doing some job just like everybody else.” As actors, it’s not a stretch for Hoechlin, Jenner and Brittain to relate to that—Brittain said that as a kid, he was so scared of being ordinary that he was serious about becoming a professional tornado chaser. But as intent as the characters are on being known as baseball players, a major point of the film is their willingness to assume temporary identities in the interest of getting laid. They’ll dance at a disco, ride a bull in a country bar, rock out at a punk show and don costumes at a theater party in an effort to win over a girl. Jenner’s character questions the phoniness of this approach, but he’s assured by upperclassman guru Finn (played by Glen Powell, who channels Matthew McConaughey’s “Dazed and Confused” character to great effect) that it’s simply adaptive. Brittain agreed, adding that everyone changes their behavior based on who they’re with, not just guys looking for someone to take home—that anyone would act differently with their family than they do with their co-workers. Hoechlin wouldn’t take a side, saying it could be both phony and adaptive. But that’s the key to “Everybody Wants Some.” What it lacks in traditional story structure (the girl, played by Zoey Deutch of “Dirty Grandpa,” doesn’t even become a factor until late in the game), it makes up for with open-ended conversation about what it means to be young and alive. Set in a summer more than three decades ago, it’s nostalgic for another time but also nostalgic for the possibilities that come with youth. “It doesn’t change,” Jenner added. In 1993, Rick Linklater brought us back to the ‘70s with Dazed and Confused. On April 1, he brings us the ‘80s withEverybody Wants Some!! — a movie that shows the lives of college students from the 1980s in three days. In the film Jake (Blake Jenner) is a freshman baseball player who learns about college life through his teammates. With his teammates, McReynolds (Tyler Hoechlin) and Bill Autrey (Will Brittain), Jake goes to parties, plays baseball, meets girls, goes crazy and enjoys every moment. The PHOENIX had the chance to sit down and chat with Jenner, Hoechlin and Brittain about their rehearsals, filming of the movie, playing baseball and their favorite moments on set. Called the “spiritual sequel” to Dazed and Confused, Everybody Wants Some!! was created the same way, and has the same vibe to it. The movie encourages viewers to have a good time and “for a good time, not a long time,” which is a line in the official movie poster. Baseball fans or not, Everybody Wants Some!! is a movie that will make audiences laugh, dance along, remise about the ’80s, and enjoy every moment. “Everybody Wants Some! !” is a quasi-sequel to Linklater’s popular “Dazed and Confused” film of 1993. It possesses the same nostalgia, the same styles/attitudes, and the same spirit as “DandC,” and it is set four years after the events of that film – except now it’s a Texas college instead of a Texas high school. For persons who grew up in that era, it will be a warm look back, and for everyone else it will evoke laughs on how we all used to live, and what we used to wear while we were living without Facebook. The three young stars of “Everybody Wants Some! !,” Will Brittain, Tyler Hoechlin and Blake Jenner, came through Chicago on a promotional tour, and HollywoodChicago – through an interviewer who actually lived the era depicted in the film – was there to grill them. HollywoodChicago.com: Living in another time can be tricky, especially since us geezers are around to remember exactly what it was like. What was your best resource for pretending you lived in 1980? Blake Jenner: The second week out there he gave us a ton of music to get us into the mindset of the era, that was first. HollywoodChicago.com: You are all depicting college baseball players in the film. Which of you had the least actual baseball experience? What is the key to looking like you’re a college level baseball player? Jenner: I hadn’t played that much before, and it was all about practicing with the University of Texas coaches. It’s takes some expert to look at me pitching a ball and saying, ‘we have to find the mother f**ker in you, boy!’ [laughs]. Hoechlin: I played in college, so it wasn’t that much a stretch. But I would say the main thing for guys who hadn’t played before it’s just one word – swagger. If you have swagger on the field, and look like you know how to play, that’s 90% of it. HollywoodChicago.com: What about using the baseball equipment from that era? Brittain: I know the guy who portrayed the catcher – Temple Baker – went through four of the old catcher’s mitts, they kept falling apart. HollywoodChicago.com: Will, since you began in independent films, which film can you describe as your breakthrough, and how did it affect your career after it was done? 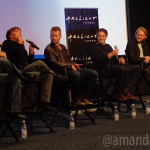 Brittain: The film ‘A Teacher’  was definitely my breakthrough, because that film went to the Sundance Film Festival. It launched everything – I got representation in Los Angeles, and I moved out there. It was my baptism into the whole festival circuit, LA and everything else in the business. HollywoodChicago.com: Tyler, one of your famous early roles was opposite Tom Hanks and Paul Newman in ‘Road to Perdition.’ Now that you’re a little older to appreciate it, what do you think you learned about being a movie star after being around two of the biggest in movie history? Hoechlin: A lot older now. [laughs] Basically, it was about how to be a professional. I of course observed their acting on set, but it was about the way they carried themselves and treated people that struck me the most. They were just two genuinely great human beings, I never felt either of them were separate from us, despite being who they were. They were just focused and professional, and always included everyone in what they were doing, including the crew. They were simply always high level masters, and taught me as a kid actor never to be an a*shole to anybody, because it would be very tough to get past where they are. HollywoodChicago.com: Blake, you were “discovered” through the ‘Glee Project’ reality series, and then worked your way onto a regular spot on the main show. How did that entire experience prepare you for the rest of show business?Jenner: It’s about preparation. On this project, for example, we had time to rehearse and prepare. On ‘Glee,’ it was close to zero time to prepare, so I had to ready to think on my feet. There were days on that show where I had to go in and record a song, then I had to rehearse the dance for that song, and then I had to go and shoot a separate scene. That would be one day. So yeah, it was about the value of time and being prepared, and not to freak out. HollywoodChicago.com: Back to everyone. The clothing was different back then. What was the weirdest piece of 1980 clothing that you wore, that you couldn’t imagine anyone wearing seriously? Hoechlin: The one I can’t imagine anyone taking seriously, but was one of my favorites, was the mesh football jersey top, paired with a really short pair of athletic shorts. I actually switched this costume to another day, because I wanted full belly exposure when I was sitting on the couch. [laughs] I wanted to see how high I could get that shirt up. Brittain: The Daisy Dukes, definitely. Those cut-off short shorts are a bit much. HollywoodChicago.com: Will, Who was the person that was most influential for you when you first started acting, and what is the best piece of performance advice they gave you? Brittain: I did a play called ‘Our Town’ at the University of Texas, and portrayed George Gibbs in it. I remember my director Marie Brown came up to me – and this was a really beautiful scene where George lays flowers on a grave – and told me not to work myself into an emotional frenzy every time, even though I wanted to do it every time. So she said, if you want to do it like that, than make sure that every time you ARE doing it like that. That stuck with me, because in the play that’s a powerful moment. I really wanted to honor that part of the story, and I keep that in mind in general. If I’m going to go for it, I’ve got to truly go for it. HollywoodChicago.com: Tyler, you did two multi-season runs on TV series [“7th Heaven,” “Teen Wolf”], playing two different characters. At what point during those runs do you think you begin to understand a character. which makes playing him that much easier? HollywoodChicago.com: I assume in both series you got a script that would focus more on your character. What is your process once that happened?Hoechlin: When you’re in the first season, you’re constantly feeling it out. But around the second season, it rushes back to you, and makes it that much easier to start again. For me, a couple episodes into the second season, I would think I know who this guy is, now it’s time to try and find more. What else can I find out? Hoechlin: Yeah, ‘7th Heaven’ was a big ensemble cast, so everyone would get a turn. Basically, I’d get a script that focused on my character and think, ‘Oh, I’m working every day this week.’ The mindset was I’ve got more to do, so I had to focus. In ‘7th Heaven,’ more than ‘Teen Wolf,’ was that I got to learn more about my character. In ‘Teen Wolf,’ I’d always get a new arc for that character every season, which was discovery for me. HollywoodChicago.com: Blake, it was reported that you’re on the short list to portray the young Han Solo in another ‘Star Wars’ spinoff. What characteristic of Han is most like you, and would you kiss a Wookie to get the part? Hoechlin: Quote of the day! Jenner: I can’t talk too much about this, but one thing I will say is that Han will presumably be in his origin phase, and we most likely will get to see the development of his classic characteristics. What made him will be interesting to explore, especially in who broke his heart and made him jaded and sarcastic. HollywoodChicago.com: Finally for everybody, what do you appreciate about living in the current day, now that you all took a trip back to 1980? HollywoodChicago.com: Do you mean better genetics?